This is an important meeting for connection and planning. Come and offer your ideas for upcoming events such as our December Holiday Celebration, the Queer Like Me Youth Art Project and Pride Week (February 25-March 2, 2019). 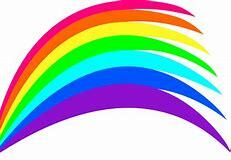 Kodiak’s “Pride” Game on Friday, October 19! Join us at the EnCana Arena in Camrose this Friday night at 7:00 p.m. as the Camrose Kodiaks tape up their hockey sticks with Pride Tape to play the Olds Grizzlys and show their support for inclusion in sports! 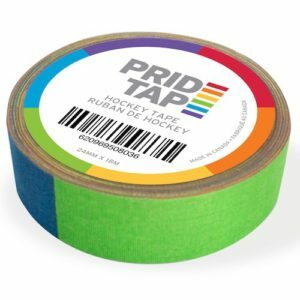 Jeff McLean, inventor of Pride Tape, will be present on Friday with the “You Can Play” display (https://egale.ca/portfolio/you-can-play-canada/). 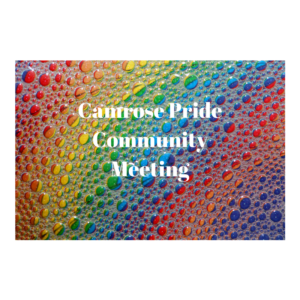 Camrose Pride Community will also have a display to continue to share our mission to create safe and inclusive spaces for all of us through hosting events, providing education and collaborations (like this one with the Kodiaks!). If you would like to show your support for inclusive sports and would like a free ticket to the game, stop by to pick up your tickets at Quantum Comics in Camrose before the Friday night game! If you would like to, wear your pride colours! Hope to see you at the game! Go Kodiaks! Attendance was great, lots of conversation and the games made it easier for people to participate. We will move our Oct. and Nov. meetings to Tuesday, Oct. 9 and Tuesday, November 13. 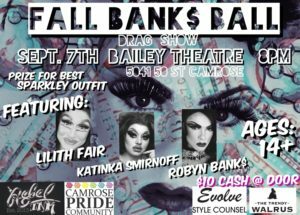 A suggestion was made to approach the Bailey about partnering for this event. Gus will call Simon. Otherwise we will look at a Potluck and Family Dance on Nov. 23 or 24th. A copy of the application was shared for information. Mike shared that altView has developed a similar program in Strathcona County with the Boys and Girls Club. It is also art based but without the therapy component. This could be information we share to support our application. It was felt that this could be very useful at our October ExpressOUT. We would need to secure a venue as the Forum would not necessarily be suitable. There was considerable excitement about fundraising opportunities at a game. 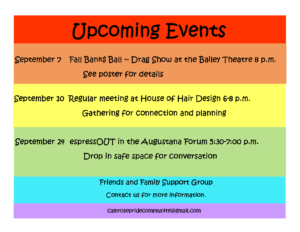 Discussion was also held about seeing if a game could be scheduled around Augustana Pride Week. Amielle will help with this piece. 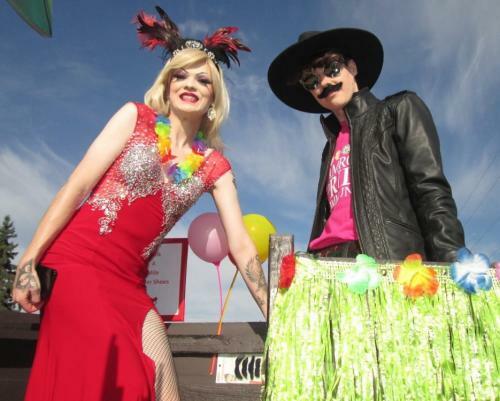 Mike shared some concerning information that one of the branches of the Lutheran Church in Alberta is indirectly encouraging conversion therapy. This is being shared through their upcoming conference booklet and to their private school network. Jen will research potential impacts to be aware of especially in the county. The question was raised about GSA activity in the county and how we can be supporting that. This may be an area where Cathie can help as a parent. Who are we not advocating for/supporting that we could be? was another topic of conversation. We have Mike, Sophie and Jen to act as resources. Mike is going to obtain Safer Space stickers from the University that we can offer to businesses to place in their window. It is also possible to provide Safer Space Training to City Council through altView. Upcoming Events ~ New Dates for Meetings! Note date change to Tuesday, July 3!